High school students interested in the Jindal Young Scholars program tour Residence Hall West as Residential Life Coordinator Cody Queen (right) shows them the amenitites and the model dorm that UTD has to offer. Photo courtesy of Scott Booth. In an effort to improve graduation and post-secondary education rates among lower-income communities, one UTD school is partnering with local high schools to provide students with a path to success. Students begin the program in their freshman year, and those who meet the program’s requirements upon graduation, including a high GPA, campus visits and participation in mentoring programs from Naveen Jindal School of Management students, are eligible for a full scholarship to JSOM. 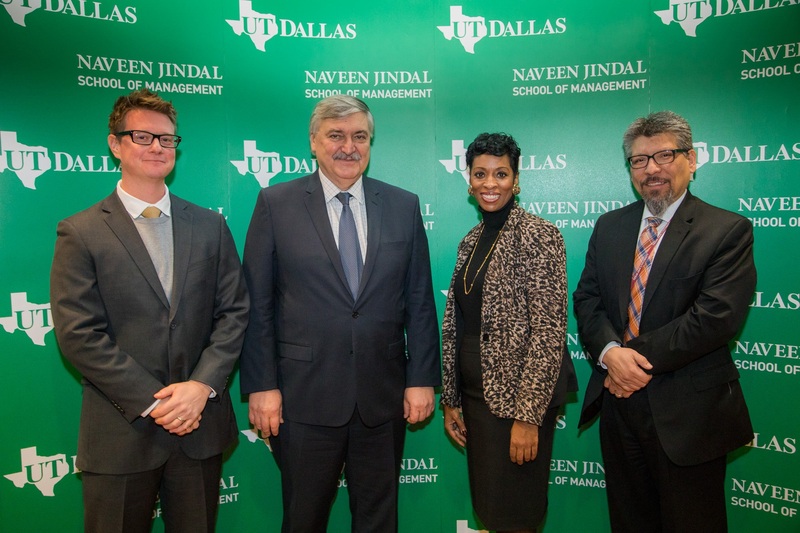 The School of Management partnered with the Dallas Independent School District to form the Jindal Young Scholars Program, holding the program’s kickoff event in early December. JSOM Dean Hasan Pirkul, who led the project, said the program is unlike existing merit-based aid programs, such as the Academic Excellence Scholarship. According to Dallas ISD, 88 percent of their students are from economically disadvantaged homes while 56 percent of its 2015 graduating class went on to college. Pirkul said the program is meant to help students starting in their freshman year and continue throughout high school until they graduate, at which point they’re eligible for the scholarship portion of the program. 84 students from the five participating high schools attended the kickoff event where they toured the campus, dined at Residence Hall West and met with representatives from UTD organizations. Pirkul said he’s received positive feedback from students and school administrators so far. 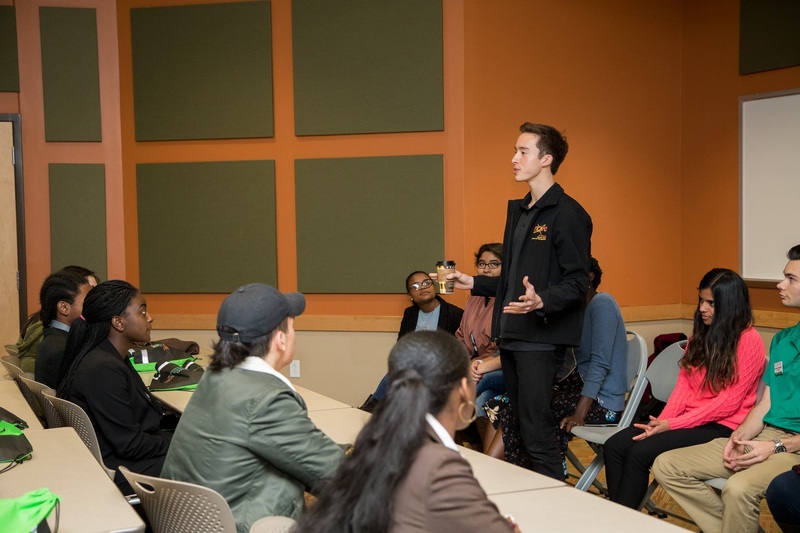 During the tour, the high school students had the opportunity to hear from a panel of UTD students, including orientation leader and supply chain management sophomore Charlie Hooper. Photo courtesy of Scott Booth. The schools in the program include Moises E. Molina High School, Franklin D. Roosevelt High School, H. Grady Spruce High School, the School of Business and Management at Yvonne A. Ewell Townview Center and W.T. White high School. The program’s first cohort attending UTD is composed of 15 freshmen in the 2018-2019 school year. These students will join the program during the remainder of their senior year before enrolling next fall. Program director Billy Schewee led the students on their campus tour and explained the qualifications required to join the program. The qualifications to earn a scholarship include a 3.75 GPA, a 26 ACT score and a 1270 SAT score. Students then apply for federal and state financial aid, while the scholarship covers all remaining costs of attendance. Danielle Petters serves as principal at Spruce High School, one of the five participating in the Young Scholars Program. Petters said UTD’s reputation as a premier university, as well as its proximity to the high school’s campus, are drawing students in to the program. Petters added that parents are excited about the program, bringing them ease of mind by providing a clear roadmap to send their children to college. Pirkul explained that while the program has been on his mind for the past 10 years, development and planning began one year ago. The program’s funding comes from endowments and fundraising efforts such as Executive Education Operations and the school’s Advisory Board, both of which provide income that’s put back into JSOM and its programs. Founders of the Jindal Young Scholars Program hosted the kickoff event Dec. 5. There were 84 students from five different high schools attending. Photo courtesy of Scott Booth. The program is planned to expand to other Dallas ISD high schools in the future, and Pirkul said he hopes other UTD schools will begin offering similar programs when they’re ready. He added that for now, the Young Scholars Program is helping disadvantaged students realize their dreams of going to college.